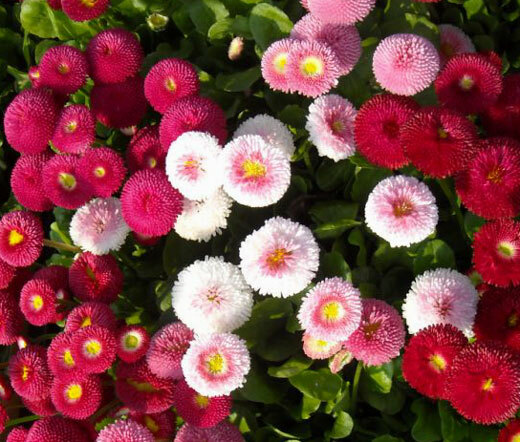 English Daisy Mix Bellis Perennis Super Enorma is the most popular variety of English Daisy. English Daisy Mix seeds produce the short lived perennial that forms rosettes-like, semi-evergreen foliage and blooms with enormous fully-double flowers that appear in shades pink, rose-red and white on a top of sturdy leafless stems. Bellis Perennis blooms generously from early spring and into summer providing a striking colorful display to any garden. The blooming English Daisy attracts butterflies. English Daisy Mix is the favorite edging plant for cottage gardens and mixed borders, and this perennial is often used to underplant spring-blooming bulbs. English Daisy looks terrific in mass planting, rock gardens, and containers. Bellis Perennis seeds have to be kept moist until germination, and the established English Daisy prefers prefers to grow in moist, well-drained soil and full sun or partial shade. The plant is grown as perennial in cooler zones, but it is biennial in warmer climates. English Daisy self-sows itself if conditions allow.